Warendorf was bred by Royal Equus Farm and was purchased by SMF in 2003. 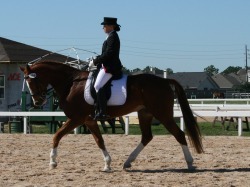 He was started under saddle in 2005 and has been progressing through dressage with very good results. He helped his rider, Jenna Stern, earn her USDF Bronze Medal in 2008. He has competed through 3rd level. He is currently in training and we hope he will make his 4th level and Prix St. Georges debut in fall of 2010. NEWS: Waren made his 4th level debut at the HDS Spring Show. He and Jenna earned their first score towards their USDF Silver medal! Ballagio, "Louie" was bred by Royal Equus Farm and purchased by SMF in 2007. He is by show jumping sensation, Balou du Rouet. Louie's grandsire is Baloubet du Rouet, who is currently one of the most successful show jumping stallions at international level. No horse has ever achieved such a record in the World Cup series , 3 wins and 2 seconds in 5 consecutive years. To add to this magnificent record he has also been French 7 year old champion, team bronze at the Sydney Olympics and many Grand Prix and Nation Cup wins. NEWS: Louie now has 90 days of jumping training. He has a lot of talent and is very careful over fences. Three fantastic gaits - very uphill! Louie is sensitive and forward - experienced rider required. 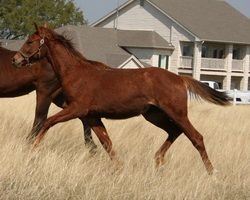 Bacarro was bred by Canaan Ranch. 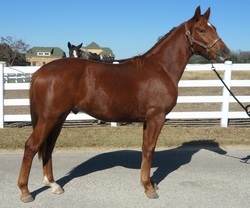 SMF purchased his dam, Atlanta, in foal with him in 2008. 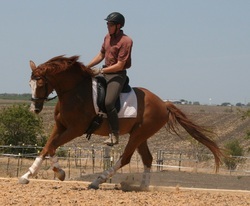 Bacarro is a very correct, athletic horse with very good movement and exceptional structural correctness. He should make a great athlete in any sporthorse discipline. He has beautiful movement and is developing into a stunning boy!